Offbeat after performing at a 2018 World Parkinson’s Day event at Southern Cross Yacht Club, Yarralumla. 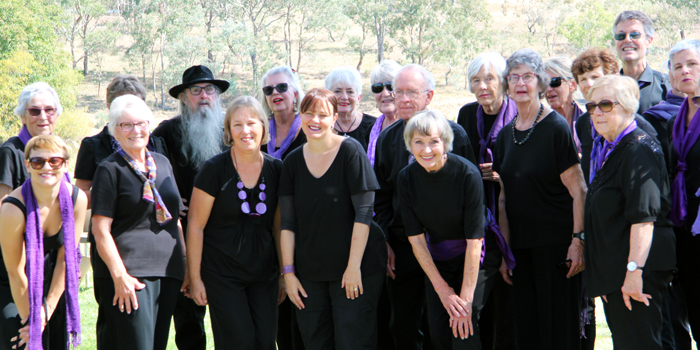 One of Canberra’s pioneering Dance for Wellbeing groups has landed its first interstate gig; Offbeat – Dance for People with Parkinson’s performers will be heading to Sydney to showcase their ‘Outstanding Achievement in Community Dance’ award-winning piece I Used to Run Marathons at DANscienCE Moving Well this Saturday, and participating in a free Dance for Wellbeing taster class on Friday to boot. As the saying goes, this is not the Offbeat dance group’s first rodeo; since the establishment of the Dance for Wellbeing program at Belconnen Arts Centre in 2013, and the extension of it the following year to Tuggeranong Arts Centre, Offbeat have maintained a regular performance schedule, appearing at World Parkinson’s Day events at Southern Cross Yacht Club every year and A Walk in the Park fundraising events for Parkinson’s ACT, held at Commonwealth Park. They’ve also performed I Used to Run Marathons at two of Canberra’s iconic institutions; the National Museum, in celebration of World Health Day in 2016, and the National Library as part of BOLD Festival 2017. Offbeat perform at the National Museum of Australia for World Health Day 2016. DANscienCE Moving Well is a day-long festival of ideas, focusing on the intersections between science, dance and wellbeing. Held at Riverside Theatres in Parramatta, the event will be a mix of dance performances, film screenings, discussions and presentations by 15 speakers from around the globe, exploring concepts as diverse as dance and mental health, recovering from illness and the origins of dance movement in babies, with a special appearance by living dance legend Eileen Kramer, aged 103 years. The brainchild of 2017 ACT Artist of the Year, Liz Lea, DANscienCE is now in its third year and showing no signs of slowing down. 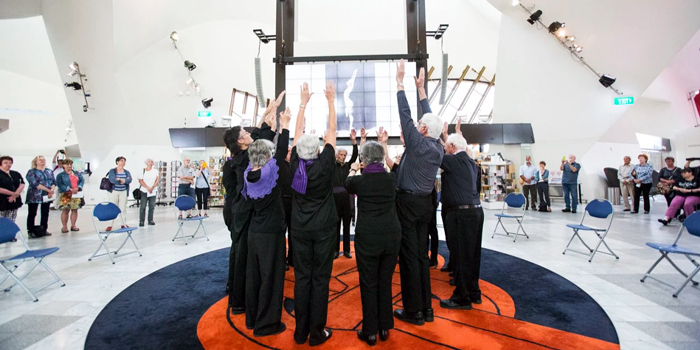 Peer-reviewed research and scientific recognition of the importance of dance to those facing challenges such as Parkinson’s or Dementia has led to government funding of programs like Dance for Wellbeing and the emergence of festivals and symposia such as DANscienCE. Patron of the event, Professor Graham Farquhar AO, a distinguished scientist, former professional dancer and 2018 Senior Australian of the Year acknowledges; “As a dancer, I made a wonderful biophysicist.” Rather than being polar opposites, it would seem arts and science are two sides of the same coin – each bringing value to the other. 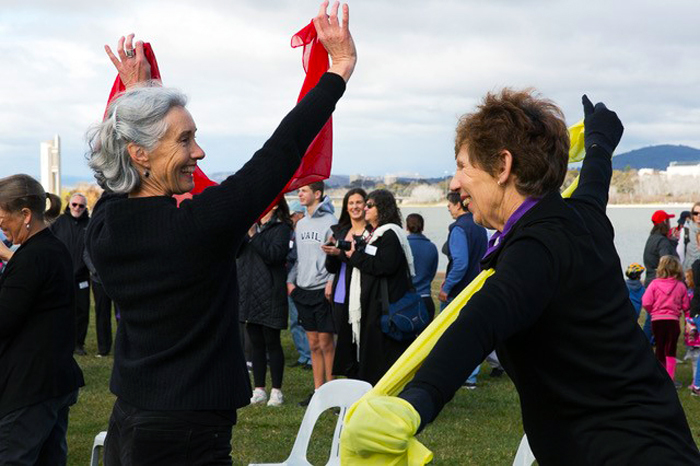 One of the Dance for Wellbeing tutors, Jacqui Simmonds (left), at A Walk in the Park 2017. Just a short trip up the Hume Highway, tickets are still available for DANscienCE Moving Well. If you’re in the vicinity this weekend, pop in and support the creative efforts of your local Canberra community and see the wonderful Offbeat group work their magic through movement. Written by Skye Rutherford; information kindly provided by Form Dance Projects. What other ways can science and the arts work together to improve the lives of Canberrans?